Daniele "Girls with Slingshots" Corsetto is coming in from West VA and Jamie King is driving up from North Carolina to join Chris Sparks and local cartoonists at Politics and Prose on July 11th at 7 pm. Bonus points if you can name all the cartoonists. I met Richard Thompson at heroescon in 2008. It changed my life for the better. Richard won't be there this year but a bunch of contributors from the book will be and so will I. Come by and celebrate the greatest comic con in that world. This is the 30th year of Heorescon. DO NOT MISS IS! come by and say hi! Hello everyone. I am still shipping books. I have another 15 to ship today and then I will be working on all of the out of the country orders. If you ordered a book and live outside of the USA, I will be contacting you about the extra shipping. I am sorry its taken so long. It looks like its going to take me three weeks to get most of the books out. The good news is I just calculated the book donations from the pre-orders that started in January till the end of March and we raised $1305.00 for the MJFF! This is the whole reason we wanted to do the online sales plus you get my pretty signature! Mike Rhode - http://www.flickr.com/photos/42072348@N00/sets/72157630100095288/ - I'm also going to add the cartoons that didn't make it into the book to this group now. It'll be at Politics and Prose in Washington, DC. Check out this Facebook page if you'd like more info. Here's a couple of stories on the end of the auction. Read it here, and bid on his art today! 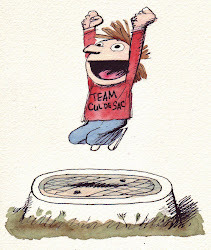 Just two days left for original art from the Team Cul de Sac auction! Sure, by telling you about this, I'm losing more and more of my bids, but it's FOR A GOOD CAUSE! Sunday, June 10, from 5 - 7 pm. Details here. "With this amazing collection, Chris [Sparks] is raising significant dollars and awareness for Parkinson's — while proving comedy can speed a cure. We're grateful to have both Chris and Richard on our team." Style Section & "Comic Riffs"